What political factions seek is not the construction of a coalition that can mobilize votes to allow a transparent renegotiation of taxes and subsidies, but a coalition that can mobilize organizational power at the lowest cost to the faction leader, to achieve a redistribution of assets and incomes using a combination of legal, quasi-legal, or even illegal methods. The organizational power of the faction is then used either directly to capture state power or to force an accommodation in the form of payoffs from the factions who are currently controlling the state. The faction’s access to economic resources either in the form of revenue or in the power to grab valuable economic resources legally or otherwise is then used to benefit faction members all the way down the pyramid, though the payoffs may be very unequal for different levels of the faction. While factions may use generalized arguments based on class, region, or interest in its public discourse, no-one in society is under any illusion that the faction is out to look after itself at the least cost in terms of paying off voters and others who need to be mobilized occasionally. When factions do not deliver on these generalized aims, broader social constituencies may grumble but they do not really expect anyone to deliver on the publicly stated general social goals. However, if factions cannot deliver acceptable payoffs to faction members, the leaders are likely to get into serious trouble. Factions rarely fear a general public revolt, given that no other political organization can deliver what the public wants. What factions actually fear is that their sub-factions may be bribed away by other factions and that the coalition may crumble. Indeed, this often happens and accounts for the frequent changes of government in developing countries that usually lead to no discernible changes in government policies, but do lead to different sets of individuals making money in turn. Given the opportunistic nature of factional membership and the shifting offers and counter-offers made by different factional leaders, it is possible to explain the extreme volatility in the factional politics of developing countries in a context where government policies are often remarkably constant. The question then is, how does a country like Bangladesh escape this patron-client democracy? Khan’s implicit message is that one needs an important capitalist sector for there to be functioning democracy. But there is nothing in Khan’s story about the dynamics that produces the capitalist sector. Turns out that Khan believes government has a role to play in kicking off that capitalist transformation. It’s just that his prescription for reform is quite different from the traditional Washington Consensus stuff. I discussed the theory of Islamic finance in the last post on this subject. 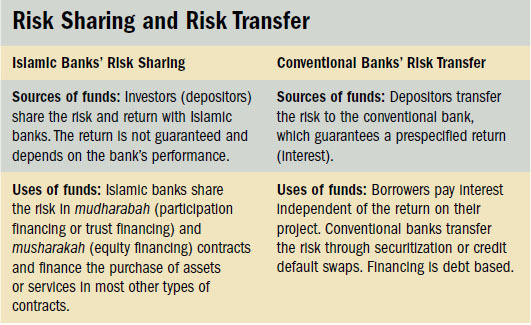 Here is a nice summary of the difference between Islamic and conventional banks’ approaches to risk. The above is from work done by Maher Hasan and Jemma Dridi, two IMF economists, on how Islamic banks performed during the global financial crisis (and the period leading up to it). In a 2010 working paper, they use bank level data from 120 Islamic and conventional banks from eight countries* over the period 2007-10 to explore why Islamic banks might have performed differently during the crisis.